Chelsea boss Jose Mourinho says the Ballon d'Or prize awarded to the world's best footballer has a negative impact on world football. The Portuguese said he agrees with Arsenal boss Arsene Wenger that football is concentrating too much on individuals instead of the team. 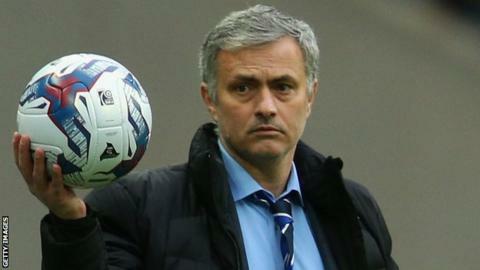 "He is against the Ballon d'Or and I think he's right," Mourinho, 52, said. "In this moment football is losing a little bit the concept of the team to focus more on the individual." Mourinho, who has won seven league titles in four different countries and the Champions League twice, told the Daily Telegraph that it is the group that wins, not the individual. He said: "For me, football is collective. The individual is welcome if you want to make our group better. But you have to work for us, [it's] not [a case that] we have to work for you. "When the top player arrives, the team is already there. It's not him who comes to discover the team, like Columbus discovering America. No, no, you are coming now to help us be better." Real Madrid's Cristiano Ronaldo won the 2014 Ballon d'Or ahead of Barcelona's Lionel Messi and Bayern Munich's Manuel Neuer. Mourinho also revealed his first job was as a teacher working with children with Down's syndrome and mental disabilities, a time when he discovered the importance of establishing relationships. "I wasn't technically ready to help these kids," he said. "And I had success only because of one thing, the emotional relation that was established with them. "I did little miracles only because of the relationship. Affection, touch, empathy - only because of that." Now he uses that experience when coaching some of the world's best players. He said: "Of course you need the knowledge, the capacity to analyse things. But the centre of everything is the relationship, and empathy, not only with the individual but in the team."